Pressure washers are one of the most useful tools to have in your inventory. With an efficient, fast approach to cleaning, even the most daunting tasks seem easy. Be sure to educate yourself with the proper method for cleaning and pressure washer uses. A lack of knowledge can result in a damaged item. What are the most common areas and household items people clean with this equipment? A majority of homeowners have a fence surrounding their yard, adding value and privacy. Unfortunately, after prolonged exposure to the elements, wood fences age considerably. Utilizing a pressure washer restores the finish on the wood to restore it to original condition. To begin the process, switch on the pressure washer. Before applying detergent, change the nozzle to the fan setting to prevent damage to the wood. Work from the bottom of the fence to the top to avoid streaks. Let sit for 10 minutes before rinsing. If any areas are heavily-soiled, use a scrub brush. Switch pressure washer off and squeeze the trigger to remove any detergent from the line. Turn the equipment back on and use a low-medium setting to rinse the solution. Start from the bottom of the boards, rinsing off one at a time. Once you are finished, let the fence dry for 48 hours. Another area that collects dirt and debris on the outside of your home is decks. This develops a film that a pressure washer can eliminate. “Feathering” hides any evident streaks the equipment can cause. To do this, overlap the previous sections you cleaned. This requires patience due to the slow, precise strokes. Feathering is the most effective and commonly-used method when using a pressure washer on a deck. “Sweep” the deck. This removes any marks left behind by the washer. If the setting isn’t correct, this tends to happen. “Long sweep” allows you to walk along the board as you clean. This method is faster than the others. However, if you have railings or any other obstacle, it will leave a line. The biggest challenge for the operation of a pressure washer is the corners. Spray while on the fan setting, forming an ‘L’ shape. Long sweep away from you and when you pull the stream back, short sweep with the grain. Warm weather is just around the corner. That means sunny days and barbeques. However, before you fire up the grill you might want to clean it first. First, disconnect the propane tank and any electrical wires. Remove the grates from the inside of the grill. Apply degreaser to the grill starting at the bottom. Let it soak for 5 minutes before spraying off. Stay several feet away as you rinse off the degreaser, using the same method as before. This should remove any built-up residue from the exterior and interior of the grill. 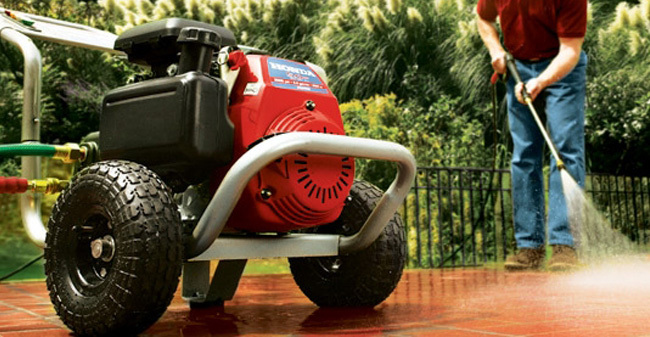 Most people don’t think a pressure washer can be used to maintain a riding lawn mower. It is important to keep it clean to extend its life. Make sure you disconnect the engine’s spark plug and remove the blades. If possible, flip the mower upside down. Use a cleaning solution and begin spraying the ‘top’ of the mower (which is the underside if you turned it over). Cover the entire machine and let it sit for 5-10 minutes. Rinse with a medium-high pressure. To clean the tires, hold the nozzle 6 inches away. This allows the pressure washer to remove any debris without damaging the tires during the process. Put mower back in an upright position to wash off the top. Let the mower dry after rinsing by parking it in a dry, sunny area. Re-attach the blade and spark plug once you are finished. Sometimes a vehicle requires more than a basic wash. Pressure washers can clean your car within 10 minutes to restore a pristine shine. It helps to remove salt and dirt build-up that soap and water don’t completely erase. 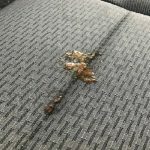 With an automotive, more pressure is necessary to eliminate the tough stains. Using around 2200 PSI, wet the exterior of the vehicle. Spray detergent on the car, scrubbing any difficult spots with a brush. Using cold water, rinse off the cleaning solution beginning at the top of the car. Hold the nozzle at an angle, using a sweeping motion to spray off each section. Pressure washer uses are nearly endless. However, one needs to keep in mind the amount of water it takes to clean. 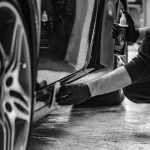 DetailXPerts, an eco-friendly, mobile auto detailing company, utilizes steam cleaning technology. Two gallons of water can wash up to 15 vehicles! Schedule an appointment today to find out how we can help you.